The background image for this page was scanned from an embroidered men's cap ("hula") we bought in Kano. Over a million people assembled for prayer in this celebration of the return of pilgrims from the Hajj. Traditional loyalties and tourist attraction: representatives of the traditional hierarchy and their musicians assemble to salute the Emir of Kano (an important cultural and religious leader but no longer a political one), making circuits around the perimeter of the palace courtyard. Horsemen salute the emir by charging towards his box on a balcony of the palace, fists upraised and thumbs pointing toward heaven. This is where Bill was accepted as an apprentice to learn more about traditional indigo dyeing. 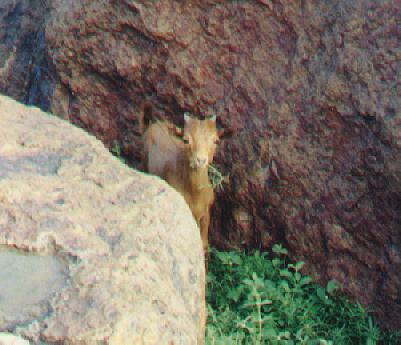 At home, at play, admiring a view; a portrait of one of our favorite denizens of northern Nigeria (a dainty brown goat).